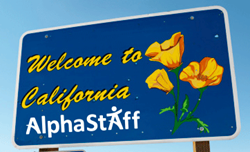 The two new California locations are part of a rapid growth expansion for the national PEO. The requirements of the Affordable Care Act has exponentially increased interest from small businesses to automate HR processes and identify affordable compliant employee insurance solutions. Additionally, the pending termination of the waivers, under the California Grandmother Clause on the first of December, has small businesses and insurance brokers scrambling to identify solutions to meet these regulatory compliance needs. However, through AlphaStaff's newly developed partnerships with insurance providers allows them to provide these much needed services to this under served small business population. Their unique solution and partnerships within the brokerage community will afford both brokers and their clients opportunities to best meet their needs surrounding employee benefits, compliant insurance products and Affordable Care Act tracking and reporting. “We are so excited about the expansion and our unique solutions to help serve the California market,” states Kyle R. Kelly President & CEO. “We are confident we will provide winning HR and insurance solutions along with ACA compliance relief to business owners currently struggling to fill these business gaps,” Kelly continues.